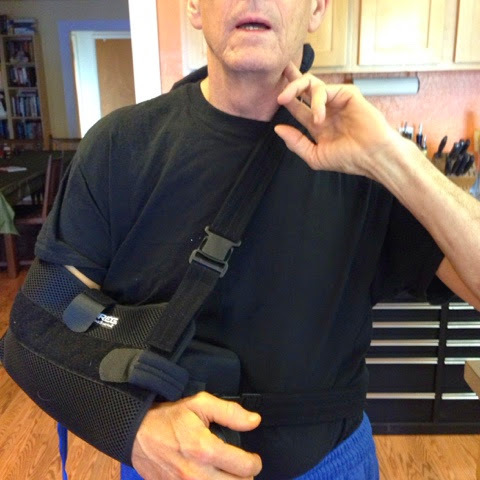 Please note that this post as well as others regarding my shoulder surgery have been done using voice dictation. I have made every effort to edit various artifacts and strange translations and hope that I have caught them all. 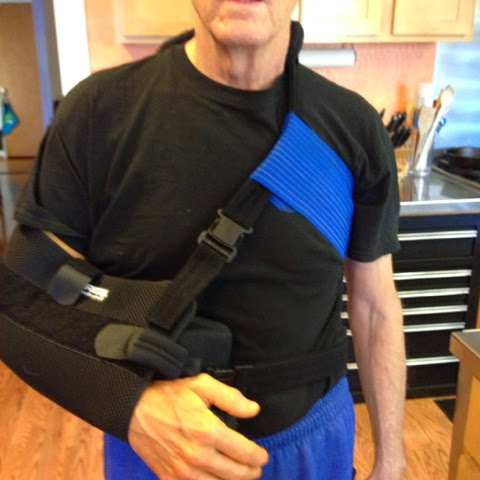 Yesterday, one week after the surgery, I had all the exterior stitches removed from my shoulder. I also got a great show and tell of the arthroscopic photos dealing with the extensive remodeling, repair and rehabilitation of the interior of my shoulder. It was a great set of photos I'm hoping to be able to post here in the future. Strangely enough, the biggest problem that I have been dealing with from the very moment I woke up from the anesthesia, was the pressure that the sling strap was pressing on my left carotid artery. That artery is the main blood supply to the left side of the brain, just as the right carotid artery it is to the right side of the brain. If you block one of those completely, you produce the equivalent of a stroke. If you press both of them firmly you can rapidly induce unconsciousness in your unlucky subject. My problem was that upon awakening I could feel the pressure on the carotid artery and one of the first things that I did was grab the strap and pull it away from the area. At that point a massive headache which I had been feeling rapidly diminished. 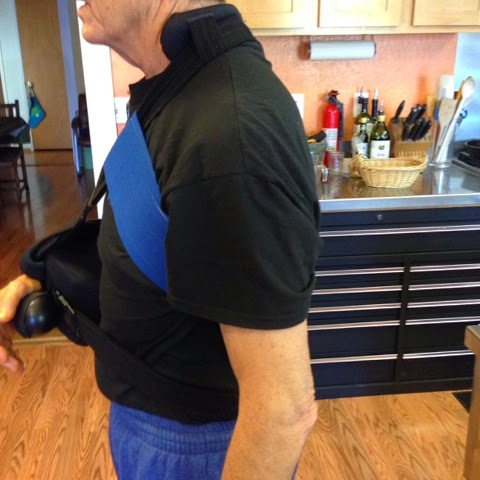 As you can see by the angle of the chest strap, above, the extreme angle is necessary in order to position the arm in the proper manner for healing. at least half of the sleep that I have lost over the last week. After trying various wedges and other suggestions and adjustments offered by my doctors office, this morning my brilliant wife Megan Mills took one look at the issue and fixed it once and for all. She wrapped one end of the long blue elastic strap from the polar care machine around the offending sling strap and pulled it in the correct direction to move it away from pressing on the carotid artery. 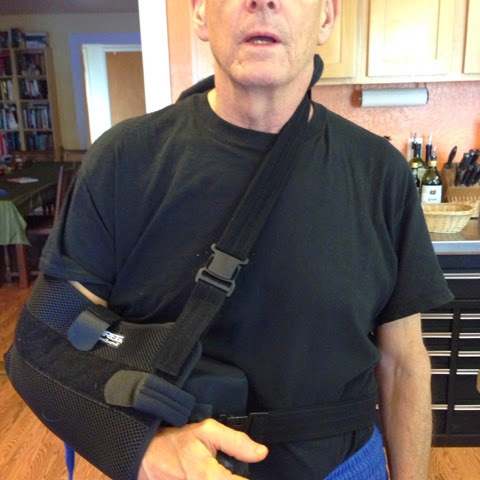 The sling strap is neatly pulled away from my carotid ordering while maintaining the correct position of the slang for my injured arm. The following series will show a 360° view of how the strap was used. No more headaches, no more being awakened in the middle of the night by throbbing artery, no more hassles. 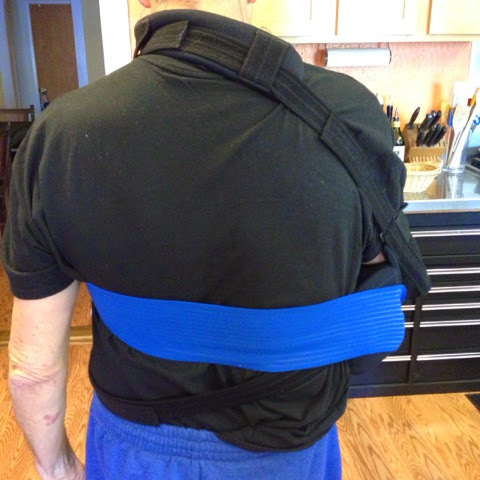 The only issue now, is how to maintain the strap angle, while using the long polar care elastic band to attach the cooling device for the shoulder. I am going to ask for one more long blue elastic strap and see what happens. 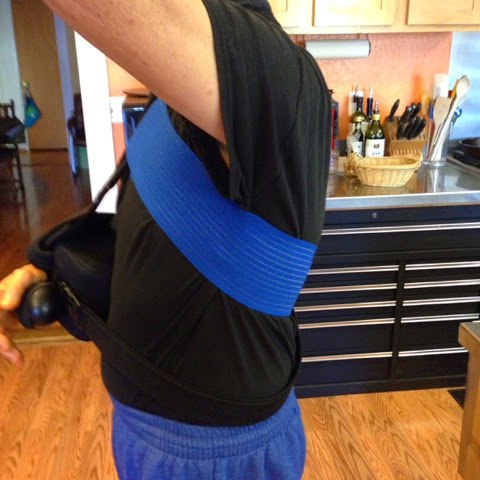 The Breg polar care device is a miracle machine in and of itself. The effects of its pain reduction made it possible for me to stop taking my heavy duty, narcotic pain medication just two days after surgery. Whenever a bit of pain would start to recur we strapped on the polar care and 20 or 30 minutes later everything was in great shape.